Brownie / Cake or Brakie’s or Cawnie’s? So, I’m not a big baker, but I like to fiddle around with stuff and I am still learning. I decided I wanted to try a couple classics mixed together. 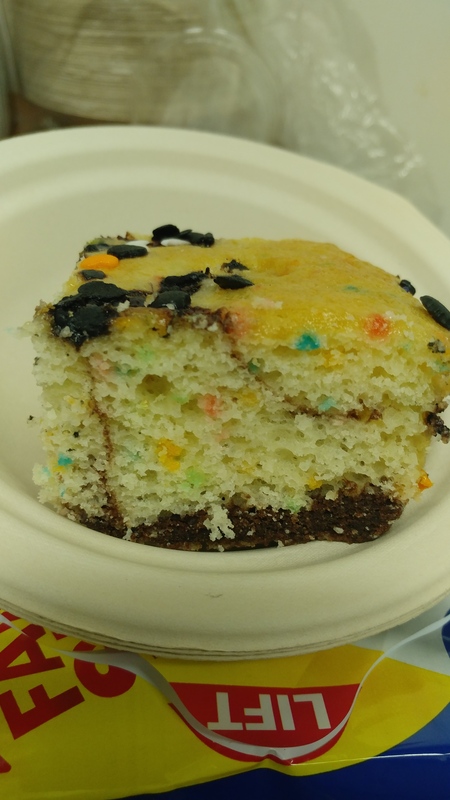 I wanted me some Funfetti cake and some awesome brownies in one. I had tried this before but it didn’t really turn out the best. Not bad, but not great. I started out by finding 2 mixes that cooked at the same temp. 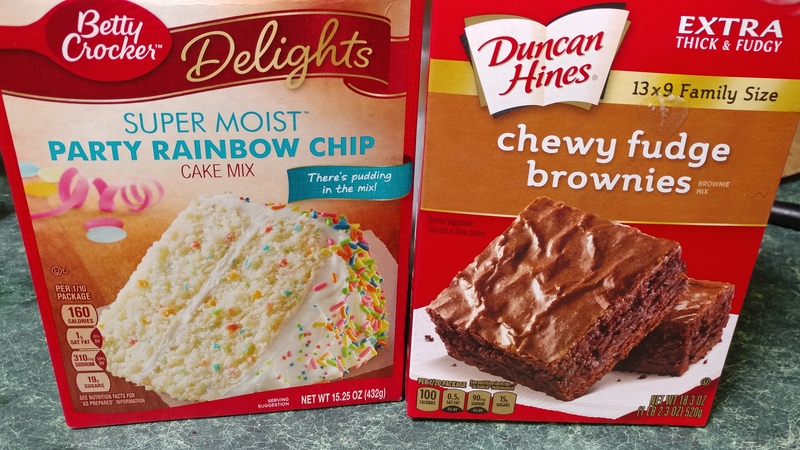 Betty Crocker Super Moist Rainbow Chip Cake and the Duncan Hines Chewy Fudge Brownie mix both cooked at a temp of 350 degrees but the length of cook time was different but I wasn’t to worried about that since this wasn’t the normal type of cake. 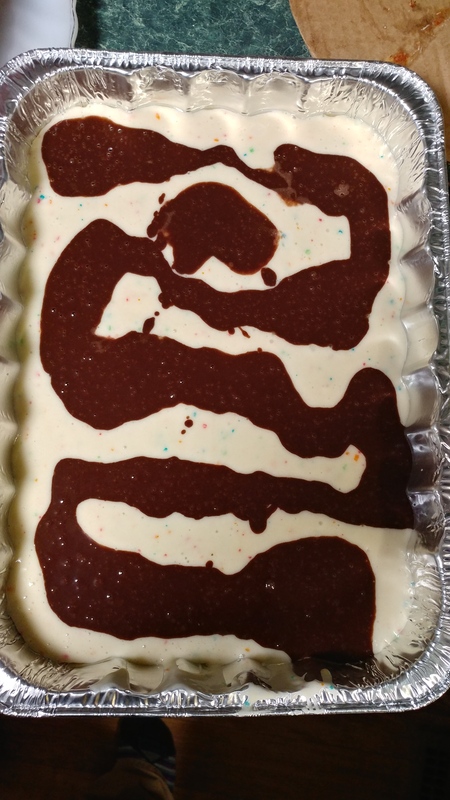 I mixed the cake batter first and poured the whole thing into a 13 x 9 disposable foil pan. Then came the Brownie Mix. 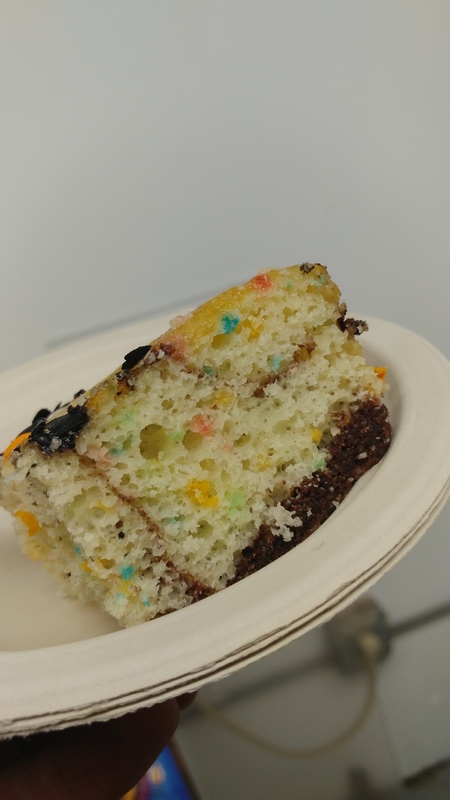 This one only called for a 1/2 cup of water, but I went with a full cup because I wanted a thinner mix that I could just swirl easily into the cake batter. (Hindsight being 20/20, I would now of only used just a little over a half cup, not double). Into the oven it went. Again, since it was more than the average cake size, I figured it should stay in there for about 10 additional minutes and that it should be rotated every so often. When it was all said and done, and the toothpick came out of the cake with nothing on it, there was a total cook time of roughly 35 minutes. 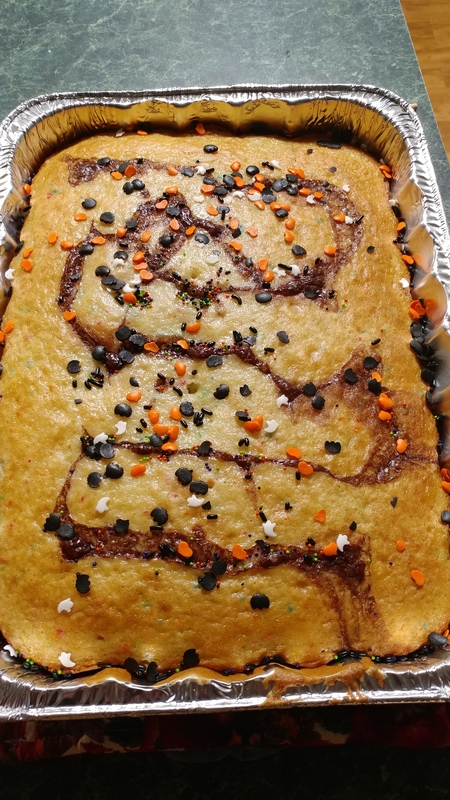 My 1st opinion when it came out was that I used to little Brownie Mix since there was just a thin trace or vein throughout the top of the cake. After cutting it, I found out that all the Brownie Mix just sank to the bottom. Next time I think the cake should cook for about 10 minutes and then mix in the Brownies. Maybe once it firms up it will hold in place better. Or, I could just add the whole box of Brownie mix next time and treat it like a Black and Tan bar! Still tasted pretty awesome! Love the experiment! Sounds like you ate on the right path.